Wimbledon Garden High Street, Oct 2014. Imagine a truly green shopping street. One that celebrates local independent sellers. One that provides platforms for the arts. One that extends existing uses such as theatres to help reach deeper into the community. As soon as you step off of the train you are wombling around Wimbledon Town Centre that has been injected with Wimbledon Common. Wimbledon Common meet Wimbledon Town Centre. By simply tweaking the existing one way system into a two way system we can relieve the main shopping street of vehicle traffic, giving us the opportunity to make it into a lively green street that allows shoppers to stroll and move at a variety of tempos. Along the shopping street are many gardens that offer different atmospheres. Some are play areas, some are sitting areas, some are nicely cultivated, some have sculptures. The high street now becomes a flexible space for a multitude of activates to take place. Informal market stalls can help shape the movement of people through the pedestrianised street by giving them freedom to sit wherever they like. These market stands help local artisans and makers sell their work and encourages the Wimbledon Arts culture. In the heart of the masterplan lies the Wimbledon Round. The Round is an open air seating area that can be used by the local Wimbledon theatres for outdoor productions, the local cinemas for outdoors cinema screenings and local schools for productions. When not in use it becomes a place to sit, socialise and browse on free wifi! Underneath the stand it a linear art gallery that can be linked to the arts council and Wimbledon Art School. By upgrading the bus station and car park to the rear or Morrisons we improve service quality for bus users and provide multi-storey car parking to relieve pressure on local streets and provide improved access to the Town Centre for car users. 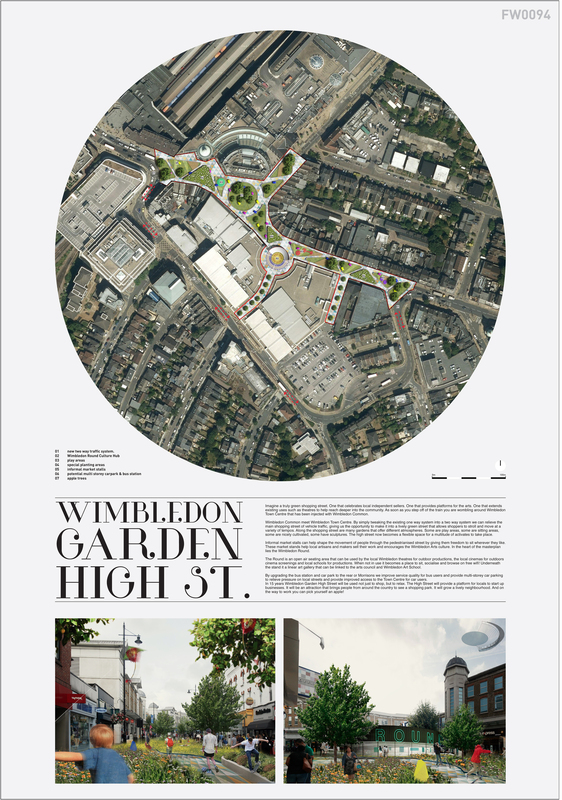 In 15 years Wimbledon Garden High Street will be used not just to shop, but to relax. The High Street will provide a platform for locals to start up businesses. It will be an attraction that brings people from around the country to see a shopping park. It will grow a lively neighbourhood. And on the way to work you can pick yourself an apple!